The Cup is a combination of wonderful stories - the tragedy that hit generations of Oliver's family; the love of an Irishman for a race on the other side of the world; and the burning but fruitless quest of an oli-rich sheikh to win Australia's greatest race. All of which were overwhelmed by the genius of a jockey and his capacity to win, for his brother. 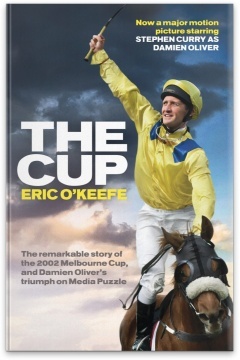 The Cup is now a major motion picture directed by Simon Wincer, and featuring popular Australian actor/comedian Stephen Curry as Damien Oliver. The movie is due for release in October. Eric O’Keefe is a polo-playing, rodeo-loving American from Dallas, Texas, where he is a frequent contributor to the New York Times. His analysis and opinions have been chronicled in The Times, the Wall Street Journal, Investor’s Business Daily and on such programs as Entertainment Tonight. The author of several non-fiction titles, O’Keefe has interviewed entertainers, politicians and pop culture icons, including Bill Clinton, Billy Crystal, Clint Eastwood and Jay Leno.